Announcements &amp; Blog - Cakes Unleashed!! This is where we post updates, promotions, news and commentaries! "I have finished editing Ethan and Lauren’s Lake Almanor wedding. They had it outside on October 24th and the weather held up beautifully for them. Lauren’s family is from Carmel and her dad is a fine art photographer. I loved her style and the way she is with her husband. They also have Ridgebacks, like we do, and Ethan is a cop as Ian is, as well. It was a gorgeous day and the hit of the wedding for me, besides the stunning bride, was the little man in his coattails and it was his 3rd birthday. Everywhere I turned he had me laughing. The cake was D I V I N E. I wanted another piece everytime I would see the photo of it. Gambonis Peninsula Grill for catering which is one of the area Basins best! Cakes Unleashed out of Greenville …she can compete on a global level…she’s that good." Taste of Plumas Event ***WE WON*** Peoples Choice!!! The April 10th Taste of Plumas won countless rave reviews as "The Best Ever" in it's four-year history. Restaurants, caterers and culinary establishments out-did themselves and the wine selection was superb. The whole evening long was filled with happy faces and compliments. This is a particularly important fact since Taste of Plumas is one of the primary fundraisers for Plumas Arts and "we work very hard to keep the FUN in FUNdraising, especially these days," comments Roxanne Valladao, Plumas Arts Director. Plumas Arts is particularly grateful to all of the culinary establishments that participated in the Taste of Plumas and as well as the merchants, artists and individuals who donated many wonderful items to the auction. And of course, it all would not have worked without the 250+ attendees to this sold-out who graced Plumas Arts by supporting this vibrant cultural organization with their ticket purchases and generous donations. The Taste of Plumas brings chefs, owners and servers out of the kitchen and puts them center stage giving these culinary artists a chance to shine in front of an admiring public. Plumas Arts is grateful and proud of our 2010 Taste of Plumas participants from… the Almanor Basin: Bella Luna Catering, Carol's Café & Catering, Gamboni's Peninsula Grill; East County: Lena's Cantina, Longboards Bar & Grill, Mt Tomba Inn, Whitehawk Lodge Restaurant; Indian Valley: Cakes Unleashed, Evergreen Market and Quincy: Alley Cat Café, American Valley Baking, Café Le Coq, Champion's, The Drunk Brush, Greenhorn Guest Ranch, Morning Thunder Café, Pangaea Café & Pub, Quincy Natural Foods, Southern Accent, Sweet Lorraine's and the Feather River College Culinary Arts Program. The event also hosted Lassen Peak Winery, Mt Tehama Winery Regal Wines, Southern Wines & Spirits and Steele Wines. The People's Choice Awards give a chance for the consumers to be the critics, but this was no pleasant task. Competition was fierce this year because everything was just so wonderful. Several ballots that were turned in noted that it was just impossible to choose. Add to this the fact that all restaurants received votes and the margins between votes were seldom very large. Plus we all know that all the presenters and the participants were all winners no matter how the voting turns out. The Strawberry Balsamic Shortcake with Triple Cream presented by the Alley Cat Café was the big winner for Favorite Dessert. It was also considered a favorite as a "sweet" pairing with the Fair Trade Organic Coffee. Longboards Bar & Grill won the Favorite Pairing for the third year in a row combining a Banh Mi Vietnamese Sandwich with their 2006 Longboards Label Monterey County Petite Sirah. Carol's Cafe & Catering's Seared Shrimp with Roasted Red Pepper Salad & Parmesan Polenta was the Favorite Appetizer. The Fresh Grilled Corn Stuffed Peppers by Bella Luna Creative Catering and Fancy Tasty Sushi by Pangaea also making strong showings. Our discerning crowd considered presentation both in terms of overall display and for the plating of the food. Cakes Unleashed's cake art was an over all display favorite with the FRC Culinary Programs Pile of Puff also getting notice. Carols Café & Catering and Gamboni's Peninsula Grill split the Favorite Presentation category with the most votes. Café Le Coq was the Favorite Entrée with Patric's hand made charcuterie featuring Paté, Wild Duck Proscuitto and Elk Sausage. Best of Show went to Gamboni's Peninsula Grill for the Hamachi Salad of fine chopped Asian slaw with yellow tail and cooked scallop. Many people were turned away for ticket sales in the days before this Sold Out event. Make sure that you get in the room next year by purchasing tickets well in advance. Mark your calendars now for the 2011 Taste of Plumas on Saturday April 9th. Nickelodeon - Parents Connect.com featured two of my baby shower cakes as part of a promotion for the World's Largest Baby Shower - December 16, 2009. "Food Network Challenge: Last Cake Standing"
Since 2005, Food Network Challenge has captivated viewers with exciting food battles from around the country. Now in it's first-ever elimination-style competition, Food Network Challenge: Last Cake Standing, six Challenge all-stars vie for the title of "Best Cake Artist in America." Premiering Sunday, April 5th at 8pm ET/PT, the series throws the pastry chefs into a grueling four-round cake competition. The Challenge alumni will be thrown a number of difficult tasks, from creating one-of-a-kind wedding creations to undergoing a 24-hour cake-making marathon. Each week the judges eliminate one cake artist, and the winner takes home the biggest prize in Challenge history: $50,000! Challenge emcee Keegan Gerhard serves as host and notable pastry chef Patrick Coston and famed cake designer Kerry Vincent lead the judging panel. "Last Cake Standing super- charges our popular Food Network Challenge series to make it the toughest, longest, most extreme cake competition ever," said Bob Tuschman, Senior Vice President, Programming and Production. "Viewers will be amazed, not just at the brilliant creations, but at the fierceness of the competition. Who knew cake decorating was an extreme sport??" The six Challenge all-stars are: Michelle Bommarito (Ferndale, MI), Courtney Clark (Ann Arbor, MI), Mary Maher (Chicago, IL), James Rosselle (Los Angeles, CA), Elisa Strauss (New York, NY), and Bronwen Weber (Dallas, TX). In the premiere of Food Network Challenge: Last Cake Standing, six enthusiastic Challenge all-stars receive their first task: illustrate one aspect of their lives through cake! The action-packed competition begins with surprise instructions to move into their kitchens and immediately start creating their signature cakes. At the elimination ceremony, a curveball shocks the competitors when they, instead of the judges, are told to eliminate the first cake artist. The five remaining competitors take a field trip to Denver's City Hall where they embark upon an exciting, but complicated challenge: create a top-notch wedding cake in only eight hours. The competitors serve as wedding ceremony witnesses and consult with the newlyweds before completing impromptu cake sketches. The judges reveal the next elimination and the winning cake is served at the reception that very night. The competition heats up when the four remaining competitors design over-the-top cakes based on an original superhero, decked out with extreme elements like moveable parts and fireworks. Hours before the competition, they are divided into teams and required to combine their cake designs. The winning team advances to the finale, and the losing duo faces off in an intense, 30-minute "cake-off" to determine who will move on and who will go up in smoke! The final three competitors endure a 24-hour cake-making marathon - the longest competition in Challenge history! The finalists create a unique five-foot birthday cake for a set of sextuplets. Upon completion, they must transport their cakes 20 miles to the birthday party. Strategy, endurance and skills are tested and one talented cake artist is finally crowned the winner! 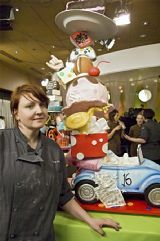 Mary Maher, winner of the Food Network Challenge, "Last Cake Standing," with her winning cake. I've had several requests to provide a Spanish version of this site and I finally got it done. Now people will have the option of viewing the Cakes Unleashed!! site in Spanish. On the Home Page, there is a spot for visitors to "click" on a section that will allow them to tour the "Home of the Incredible Edibles!" in Spanish. Earn Free Credits and Reduce the Cost of Your Next Event or Save Your Credits and Get a Cake for FREE! -----> Desiree' earns $30.00 in free cake credits! It's simple, add your name, email address and phone number to the back of my business card when you pass them out to your friends or give this information to your friends and let them know to tell me who referred them. I will call or send you an email to let you know how much credit you have received and place your credit amount in your file for you to use on your next cake order. There is no expiration date for your credit. Credit will be placed in your file once your friend has paid for their cake in full. Even if you have not ordered a cake from me you will still be able to earn "free credit". Note: I will not issue cash for "free cake credits". They can only be redeemed towards your next cake order. In 1963: America's first working toy oven, was turquoise and had a carrying handle and fake stove top. It was invented by designers at Kenner Products (now a division of Hasbro). In its first year, over 500,000 lucky kids talked their parents into spending $15.95. By its fifth birthday, the EASY-BAKE Oven was a household name. In 1965: Hasbro introduces the Easy-Pop Corn Popper, Bubble gum set, Birthday Cake, Party set and Kid Dinners - these were mini TV-dinner-like trays partitioned into three sections to hold beef and macaroni, peas and carrots. I know, I know, (be still my stomach) but hey kids were eating their vegetables. In 1968: General Mills creates very cool miniature boxed versions of its Betty Crocker products for the EASY-BAKE Oven. I still have some - unopened, of course. In 1969: The Premier avocado green (which matched the shag carpet) EASY-BAKE Oven came out with more dials, a fake clock and even an oven hood. In 1970: Avocado green was replaced by harvest gold (ah, the 70's) when the new Super duper EASY-BAKE Oven -- hit the market. It baked cakes up to twice as big as the original model and included a working 20-minute timer. 20 minutes? I thought it was 12. No wonder my cookies never crumbled. In 1973: Since the world needed more snacks, The EASY-BAKE Potato Chip Maker makes the scene. In 1978: The country's favorite oven goes high tech with an orange, white and brown Mini-Wave Oven that resembled a microwave. It also had a mock digital clock that always said 12:30. Mock my eye, if it constantly read 12:30, it looked just like the clock on my microwave? my TV, my coffeemaker? In the 80's: The new EASY-BAKE Dual-Temp Oven let you bake treats on "high" or "low." And, once again got a fashion maker-over - like Mom's new appliances --- white was the new black. In 1993: The EASY-BAKE Oven & new Snack Center (with a warming tray to melt toppings) was pretty in pink. By 1997: With more than 16 million EASY-BAKE Ovens having been sold, the product line expands to include even more delectable edibles; Cr?me Pups Bake Set made little cake sandwiches, All My Love Chocolates kit made candy, Tiny Turnovers Bake Set made pastries. Also, EASY-BAKE crosses the T's and dots the I's with Kellogg's pop-tarts, M&M's, Dunkin' Donuts and Oreo Cookies? oh, stop drooling. In 2003: EASY-BAKE Oven turns 40 and introduces the Real Meal Oven allowing kids to make full meals with their EASY-BAKE Oven including Macaroni & Cheese, Pizza and even French Fries. Additionally, EASY-BAKE takes on a brand new modern look with the new updated Deluxe microwave style oven design. In 2007: EASY-BAKE Oven goes back to the classic style with its EASY-BAKE Oven and Snack Center.